Bigasoft iPhone Ringtone Maker for Mac, an ideal iPhone ringtone converter for Mac, can easily make and boost custom iPhone ringtone M4R from your personal music and movie collection including MP3, WMA, M4A, WAV, RA, AVI, MPEG, WMV, DivX, Xvid, MP4, H.264/AVC, AVCHD, MKV, and so on for iPhone, iPhone 3G/3GS and iPhone 4. The powerful iPhone ringtone creator for Mac can also directly send the new created ringtones to your iPhone via USB cable. 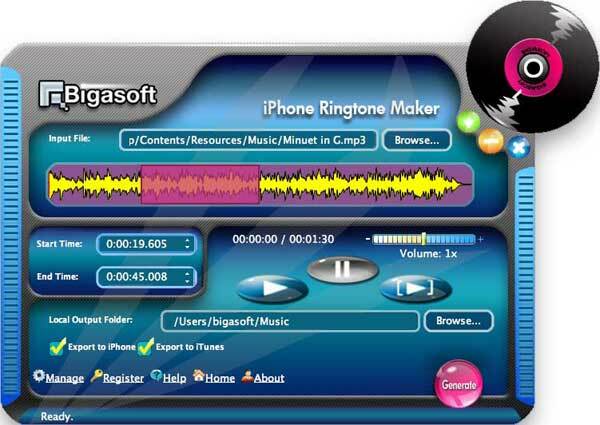 Qweas is providing links to Bigasoft iPhone Ringtone Maker for Mac 1.2.0.4024 as a courtesy, and makes no representations regarding Bigasoft iPhone Ringtone Maker for Mac or any other applications or any information related thereto. Any questions, complaints or claims regarding this application Bigasoft iPhone Ringtone Maker for Mac 1.2.0.4024 must be directed to the appropriate software vendor. You may click the publisher link of Bigasoft iPhone Ringtone Maker for Mac on the top of this page to get more details about the vendor.